Cooling devices based on the Peltier effect were first demonstrated by French physicist Jean Charles Athanase Peltier when he noted the presence of heating or cooling at an electrified junction of two different conductors types (opposite of a thermocouple). Widespread commercial use depended on finding efficient materials that could be produced inexpensively. Music synthesizers, to be practical, needed to await the availability of miniaturized electronics like transistors and memory elements. Light amplification similarly depended on affordable sources to be anything more than a laboratory curiosity. Fortunately, by the mid 1950s such entities were becoming reality. This article reports on a few of those items. Music, television, recording, and air conditioning are major fields expected to benefit from new electronic developments recently demonstrated by RCA. Revealed to the public for the first time are an "Electronic Music Synthesizer," an "Electronic Light Amplifier," a new TV tape recorder, and an all-electronic cooling system. 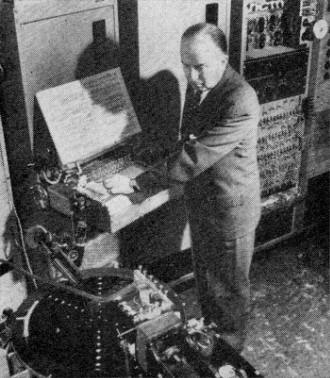 The "Music Synthesizer" is an elaborate device that generates any tone produced by the human voice or musical instruments, as well as tones beyond the capabilities of these sources, including tones never heard before. Capable of solo or ensemble effects, it is expected to open new horizons for composers who could take advantage of its almost limitless possibilities. 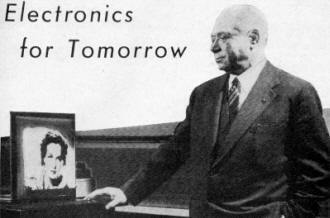 Brigadier General David Sarnoff, RCA head, watches demonstration of "Electronic Light Amplifier." Another use of the synthesizer could be in phonograph record production. Since the unit can produce any sound imaginable, it may be used to rejuvenate old pressings into new records with full tonal range and complete freedom from noise and distortion. In addition, the synthesizer can provide remarkably authentic renditions of older music since it can produce accurately the tones of the old instruments for which many great composers wrote. For music lovers, scholars, and historians, this feature should prove of great value. Research and development of the synthesizer is under the direction of Dr. Harry F. Olsen, Director of Acoustical and Electromechanical Research at RCA's David Sarnoff Research Center, Princeton, N.J.
RCA's Dr. Harry F. Olsen operates keyboard of the new "Electronic Music Synthesizer." Equally sensational as a major development in a field followed by millions, but still largely experimental, is RCA's "Electronic Light Amplifier." Described as a new form of illumination, "electronic light" (also called "cold light") does not depend on combustion or incandescence as does conventional light. Rather it results from the excitation of electrons in certain luminescent materials. By using greatly amplified values of "electronic light," RCA engineers hope to perfect - by late next year - a new type of video known as "mural television" in which the present TV picture tube will be replaced by a thin, flat screen that can be hung on the wall like a picture. 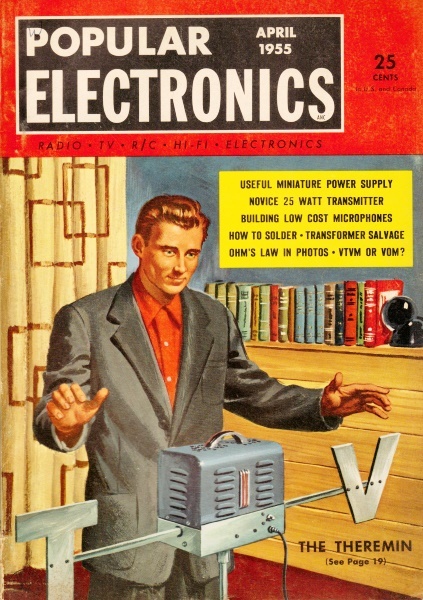 This development, combined with a wider use of transistors, is expected to eliminate the need for all electron tubes in TV sets and reduce its size to that of a small box, containing all the circuitry and controls needed to enjoy programs on the wall mounted screen. Electronic light and its amplification have potential applications in other fields such as radar and x-ray work, but details on these are not yet available. Heralded as a major step into a new era of "electronic photography" is RCA's new TV tape recorder, now installed for field tests at the National Broadcasting Company. Both color and black-and-white telecasts can be recorded on tape, and an unlimited number of copies made quickly and cheaply. Ultimate uses of this device are forecast in the motion picture industry which could use the process to make movies without any photographic developing. Pictures can be viewed the instant they are taken. The new device will also aid telecasting, education, and industry in general, to say nothing of its tremendous potential for home use. TV tape recorders are expected to become as widely used as sound tape recorders. The fourth electronic wonder at hand is an air conditioner that works without any moving parts, motors, or compressors - a completely noiseless machine. Prototype of this development is a small electronic refrigerator in which cooling is achieved by the so-called "Peltier effect" in which current through two dissimilar materials produces a cooling effect in the region of the junction, like a kind of reverse thermocouple effect. The problem here is largely one of researching the right materials to do the job.